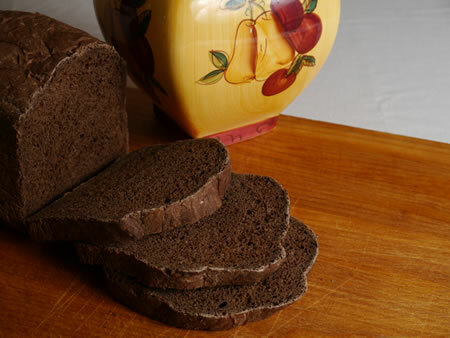 I hadn’t had much experience with dark rye bread until I tried this mix for Black Russian Bread. The experience was eye-opening! Since then, I’ve found a recipe for black rye bread. At the same time, I also like to have this mix on hand. 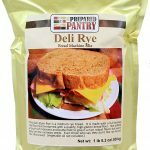 It makes it easy to make amazing ham and Swiss on rye sandwiches. 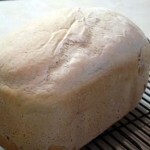 Here’s what it was like the first time I made this bread from a mix . . . I read the instructions on the package. To my surprise, they called for water of exactly 80 degrees to be used in making the bread. As my regular readers know, I use a Zojirushi bread machine. The bread cycle includes time for preheating. So I just used water from the tap. If your machine doesn’t have a preheat cycle though, I’d recommend that you follow the directions on the package. I added the ingredients as recommended by the instructions that came with my Zo, being careful to make a little nest for the yeast. I chose the basic setting and let the bread machine do its thing. As you can see, the final product looks amazing! The bread is a dark, brown color and the loaf was well shaped. The bread smelled like a heavy, rye bread while baking. It also had a lovely rye aroma. However the final product had a lovely cake-like texture. The taste was more like a light rye. The rye was there, but it wasn’t overpowering. This bread was fine, however it wasn't as good as Prepared Pantry's phenomenal Black Russian or Dill Rye bread mixes. 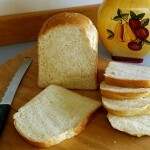 I recently tried a package of Prepared Pantry's Buttermilk White bread mix. It turned out great and I have no problem recommending it to you .